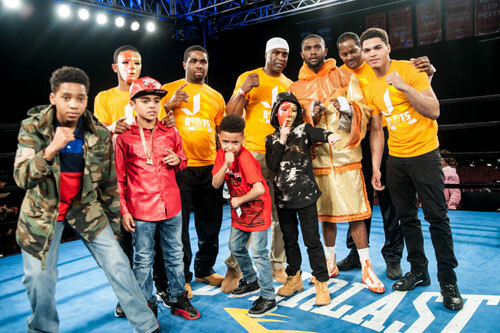 The education of rising ring star Jaron Ennis continued Friday night at the 2300 Arena in South Philadelphia. Ennis secured his tenth consecutive victory with a rough and tumble points win over James Winchester, 20-13, 8 KOs. Ennis, 19, was in charge all night, but had to deal with Winchester’s rough-housing tactics intended to ruffle the feathers of the young welterweight. However, Ennis, now 10-0, 8 KOs, managed to keep his head, fight smart, and gather the unanimous decision win over six rounds. A switch-hitting Ennis cruised to an early lead in the first round, hitting Winchester from both sides with relative ease. Winchester, Reidsville, NC, grinded forward, but failed to catch the speedy star with any significant punches. Then just before the bell ended the round, a frustrated Winchester grappled Ennis along the ropes, shoving his head and shoulders into the swaggering youngster, and cuffing him with any punch he could muster. Ennis smiled, but appeared annoyed as the round came to a close. Both boxers stayed on script in round two. Ennis kept firing punches, switching stances, and landing all the important shots. Then suddenly, Winchester tackled Ennis to the canvas. If that infraction wasn’t enough, while they wrestled on the floor, Winchester threw a serious right as he knelt over a prone Ennis, lying flat on his back. The incident cost Winchester a penalty point from referee Shawn Clark. When the action resumed, Ennis came out a little hot, but eventually calmed down and started to effectively hit Winchester once again. Ennis hurt his foe with a good right. Winchester kept bull-rushing Ennis, but in the clinches Jaron snuck in a few borderline shots to Winchester’s beltline. 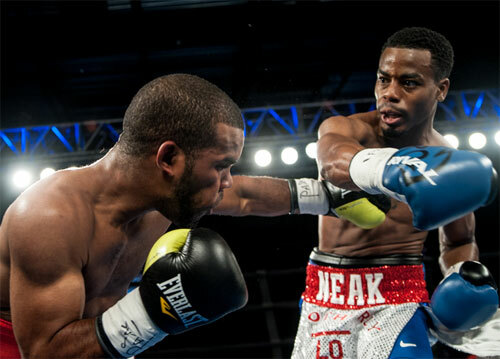 Ennis stayed in control over the next two rounds while Winchester continued to test Jaron’s ability to cope with his rugged ways. Round five was probably Winchester’s best. He managed to land a few good shots as Ennis got more aggressive and opened up his attack. However, Winchester’s potshots were still not enough to take the rough round on my card. Even worse, Winchester’s steadily reddening right eye finally split open and began bleeding. Ennis closed the round with a flourish. In the final round action, it was mostly Ennis on the offense, but a bleeding Winchester tried to turn the fight with some last-minute heroics. 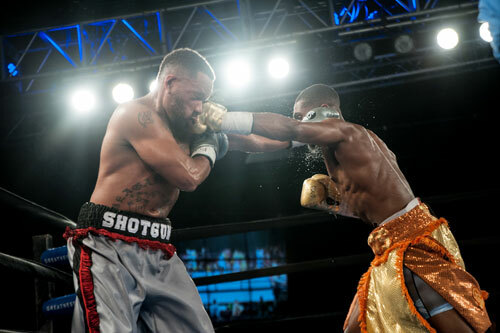 He nailed Jaron with one wide right and later a right uppercut, but Ennis took the shots and kept his own artillery flying. The fight ended and Ennis appeared to have another clear victory on his burgeoning resume. The official scores confirmed it. Judges Rose Vargas, Bernard Bruni, and Jim Kinney all turned 60-53 tallies in favor of Ennis. This was only the second time Ennis was forced to the limit. 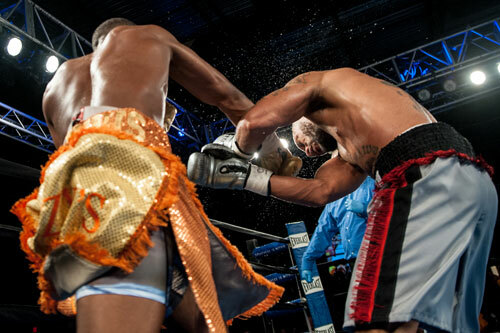 However, it was a different story than the first time it happened, last year in his sixth pro bout. That night in the same arena, Ennis looked tired and over-trained. But against Winchester, Ennis was in fine form and the fight only lasted the full six because of Winchester’s toughness and experience. Overall, this was a good learning experience for one of Philly’s very best young students of the game. 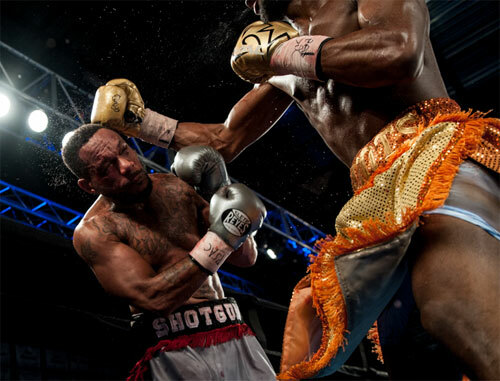 In the semi-final bout of the night, Philly cop Manny Folly, another standout in the cream of the crop of the City’s young talent pool, also won his tenth professional bout, and was mightily impressive in doing so. 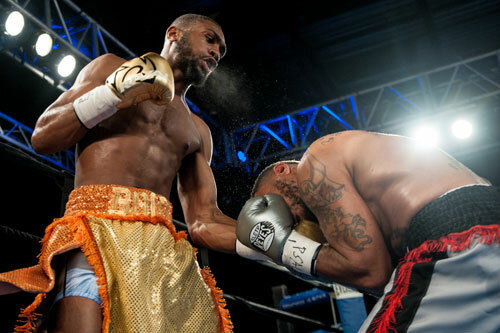 Folly scored three knockdowns in round one, and won by TKO over Dominican Luis Hinojosa, 30-11, 17 KOs, after just 2:18. Folly softened Hinojosa with a hard left hook early on, but it was the Philadelphian’s right hand that looked lethal on this night, and it was responsible for all three of Hinojosa's trips to the canvas. The final blow was a ramrod that crumbled Hinojosa and forced referee Eric Dali to stop the slaughter. For the second straight time, Folly fought a vastly more experienced foe and handled him with ease. 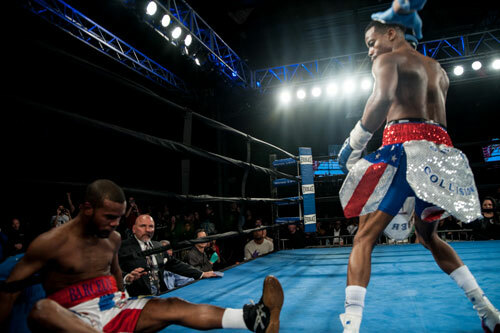 In fact, this was Folly's fourth consecutive first round stoppage (all at the 2300 Arena). Where the first two may have come from favorable matchmaking, this last pair of accomplishments was more an indication of what a steadily active Folly, 10-0, 8 KOs, is capable of doing. So let’s hope he continues to fight solid opponents on a regular basis. His arresting performance told the tale of a fighter who is ready to move up a level. 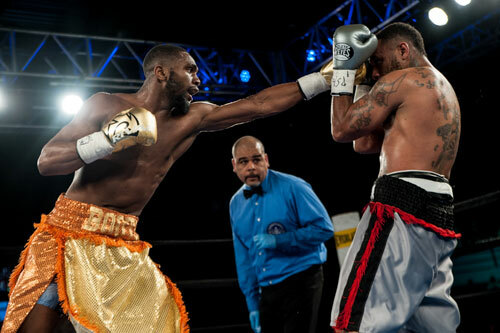 In a super middleweight bout scheduled for four rounds, Darren Goodall, 5-0, 4 KOs, New Milford, NJ, knocked down Bronx-based Honduran Juan Zapata, 4-11-2, 2 KOs, in round one and again in round two en route to a second round TKO. 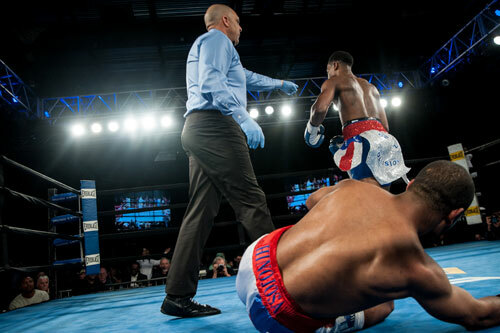 Zapata barely beat the ten count, but referee Shawn Clark stopped the fight at 1:51 of the second round. 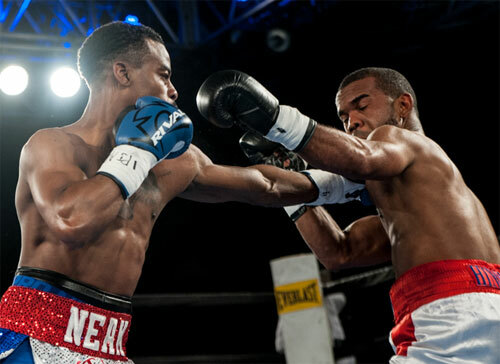 In a quick junior lightweight bout, Californian Brandon Lee won his second straight fight by knockout. Lee (2-0, 2 KOs) dropped former MMA fighter Seth Basler (0-1) with a left in round one, and finished him off moments later with an extended onslaught of punches. Referee Eric Dali jumped in to save the debuting Basler, Marion, IL, at 2:12 of round one. 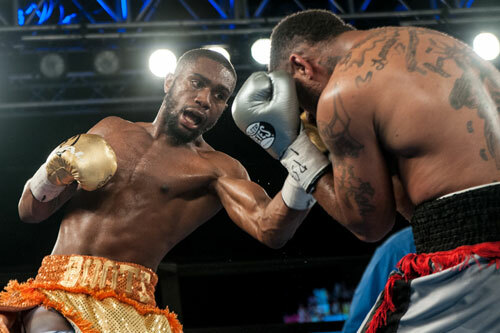 In the opening fight of the evening, local lightweight Joshua Jones, 4-0-1, 2 KOs, won a one-sided unanimous 4-round decision over Dustin Arnold of Coral Springs, FL, 1-1. There were no knockdowns, but Jones tagged Arnold with several clean shots and took the official scorecards by wide margins. Rose Vargas and Jim Kinney both had it a 40-36 shutout, while Bernard Bruni saw a point closer at 39-37. 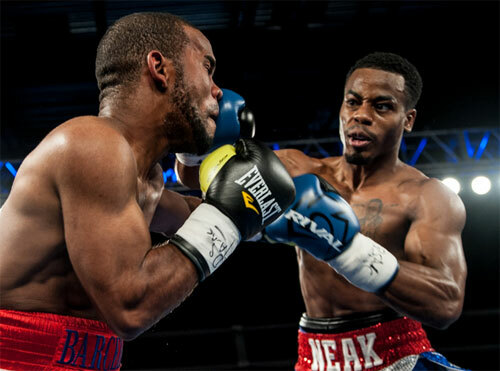 The show was promoted by Victory Boxing Promotions.